← The Enlightenment Meets Social Media: Want to Help? As a new teacher to both the US History I curriculum and to teaching 9th graders, I was struggling teaching students about the difference in the branches of governments. I tried a variety of ways to do this: I gave an overview of each branch, students completed a graphic organizer for the branches, students sought answers to questions using the Constitution [ex. Can Mr Milton run for President? Why/Why not? *], and I created a board game to show the arduous quest for a bill to become a law. Still, I did not feel that it connected to my students. I felt like my job of bringing the Constitution to life was not yet finished. During a free period, I popped into a colleague’s classroom to discuss the Constitution. It was here that she said one phrase that really sparked my brain into gear. Let me preface this by explaining I have recently been thinking quite a bit about superheroes and supervillains – particularly how they carry out mundane things like grocery shopping or online dating**. My colleague said, “…powers of the branches.” Obviously, my mind immediately jumped to “superpowers of the branches” and went into overdrive. I explained the concept to her and collaboratively we came up with the Super Branches of Government! From my colleague’s classroom. This student focuses solely on the Commander in Chief role of the President. The Prompt: What if each branch of the US government was a superhero? What would it look like? What superpowers would it have? What weaknesses would it have? Use the US Constitution to create the new American hero! As abstract ideas can sometimes be overwhelming, I’m starting off with the personal. “What do you excel at? What is an ability that you have?” I then shared with them that students have said my hearing is amazing. We discussed how I could find a symbol for excellent hearing and we decided that a huge ear would be appropriate! Luckily, I had just the thing on the next slide, an image of me with a giant ear. Students then drew and shared themselves with something to symbolize what they are great at. Students then prepare by looking more closely at their assigned branch of government prior to meeting with their group. This is the form that my students used. Brainstorm and create a superhero. What powers would it have? How would you represent the powers? Students were put into small groups, given a large piece of paper, an assortment of markers and colored pencils, and given their branch! I guided them slightly, mostly reminding them to use the tools we had developed [notes and graphic organizers] as well as the Constitution itself. I attempted to help students focus on the powers of the branch and how to best represent them. I did add to my initial instructions for students to make a key to explain what the elements represented. Switch with another group and examine the superhero they created. What powers are missing? What limitations does the hero have? Write a list for the group to help them. Add some symbols they could possibly use. Students looked at the superheroes created by the other groups. This is done not only to generate ideas, but to also look at the different government branches. When they get their superhero back, the group can add to it based upon the suggestions from the other groups. Examine the superhero for the branch that you did not help look at yet. If you were to design one for it, what might it look like? What powers would it have? How would you depict it? What would you include that was not included in the one you just examined? What limitations does it have? How would you depict it? I am currently at this point in this project. Students will use Canvas, a student management system, to write individual answers to this prompt in a discussion forum. When completed, students will comment on two of their classmates posts. Overall, I have been pleased with the discussions of the groups. My favorite impromptu discussion between students in rival groups discussing which superhero was stronger. I was beaming but remained silent during this exchange as it is something as a society we still wrestle with. I am really looking forward to the debrief discussion! So that is one way that I am teaching the Constitution, how are you doing it? Next Week: Teaching the Bill of Rights using improv! * I cannot. Article II Section 1 states that you must be 35 years old. I can, however, run for US Senate. 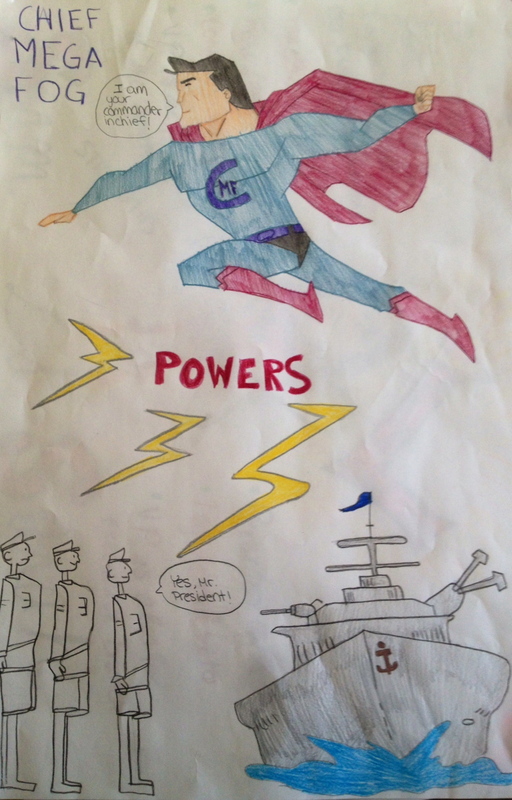 This entry was posted in History and tagged Constitution, education, History, Social Studies, Superheroes. Bookmark the permalink. Very cool idea. Mind if I steal this lesson. I think the concept will really connect to my students. Thanks so much for sharing. My last lesson wasn’t as cool but pushed me to use a different assessment methodology We discussed the events leading to revolution. Students role played loyalists patriots moderates and parliament. Some good ideas but not as in depth. So asked them to answer question themselves “Were the colonists justified in rebelling against Britain. They created audio file podcast type response. Was cool for many students who aren’t strong writers. No where near superheroes but students really bought about actions of colonists and some made connections across time to any government that doesn’t represent the people. Thanks again for sharing. You continue to push me to do more in my classes. I love the idea of having students use audio to address why the colonists rebelled against Britain! I think altering types of assignments in general is a great idea and just realized that I haven’t used podcasts yet this year. So thank you. Please steal and adapt this lesson! Let me know how it goes. Also, thank you for the last bit. I am trying this with my 8th graders in a couple of days! I am so excited. It is so creative and higher level thinking.